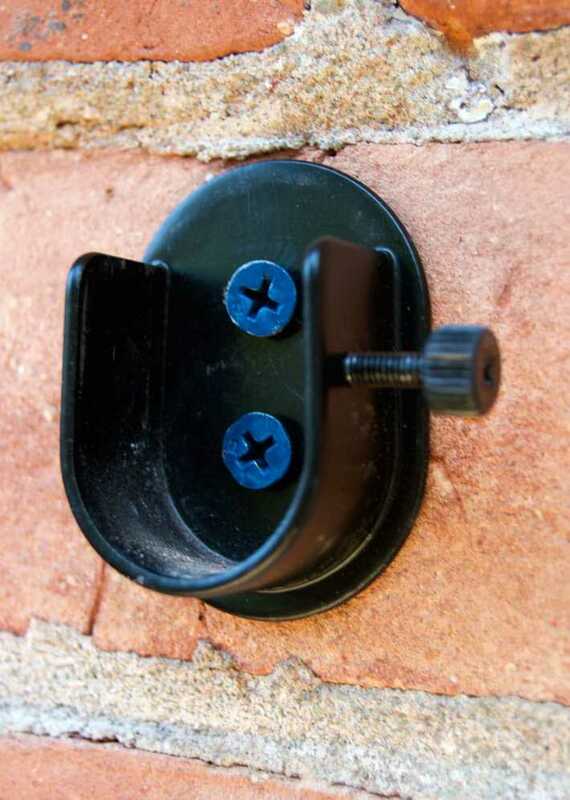 HOW TO HANG ANYTHING ON BRICK OR CONCRETE! When I wrote a post a couple of weeks ago on how to make some simple planter boxes you were all quite pleased with that, but what you REALLY wanted to know was how I got my planter box brackets attached to my brick house. HOW DO YOU DRILL INTO BRICK??? That was your question. So today … I’m gonna teach you. I could have taken this question answering opportunity to answer the very popular question “Karen … how many burritos can you eat in one sitting?” but I’m gonna go with drilling into brick. To screw into brick there are only two things you need. Anchor screws ( Walldog, concrete screw, screw anchor) and a masonry drill bit. The anchor screw looks like a regular screw, and it is … but it also has an extra set of raised threads that help it cut and grip into very hard material like brick or concrete. A masonry drill bit is a regular old drill bit with a special tip on the end. 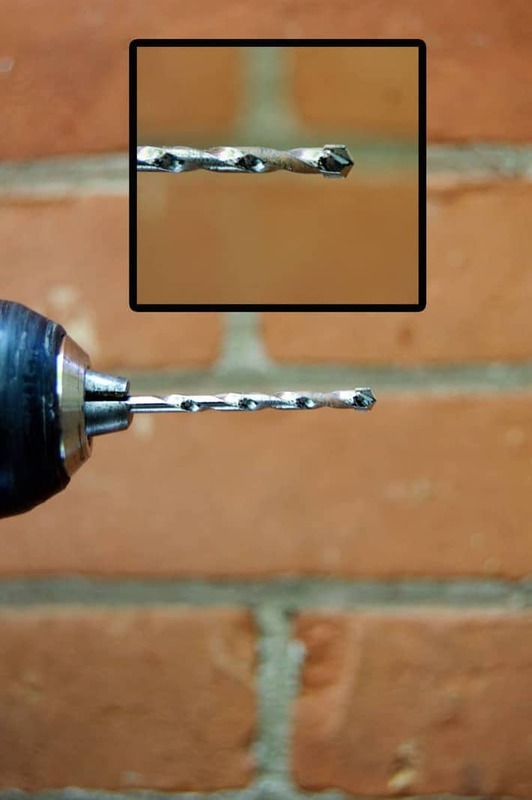 If you’re at home and you don’t know if what you have is a masonry drill bit just look at the end of it. If it has a a sharp spade-like tip on it … that’s a masonry bit. Technically they work best with a hammer drill but it doesn’t matter. It’ll work fine with a regular drill too, it’ll just take a tiny bit longer to drill through the cement or brick. It’s easier to drill into the mortar than it is into the brick because the mortar is softer, but sometimes the grout just isn’t where you need your hole. So you can drill straight into brick too, it will just take you a bit longer and dull your bit quicker. 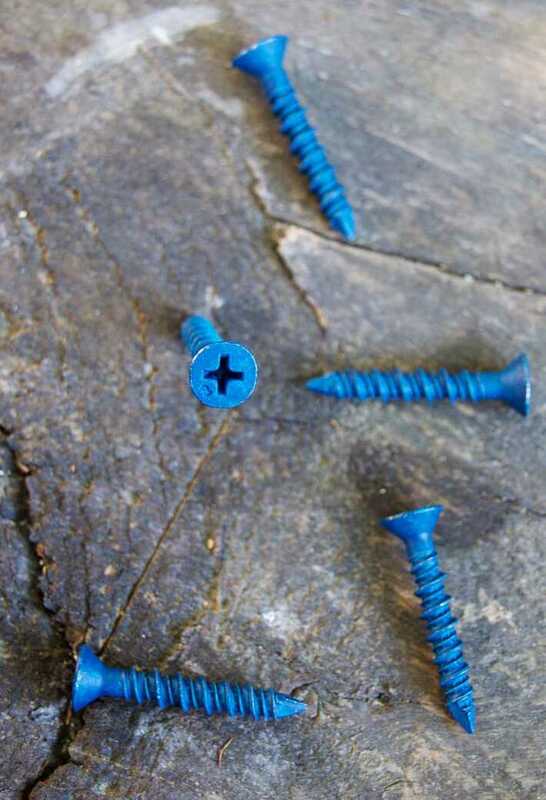 You need to use a drill bit that’s a size or two smaller than your anchor screw, otherwise your hole will be too big and your screw will just slide right in. For example, I used a 3/16th screw with a 5/32 drill bit, which is 2 sizes down in a standard bit kit. 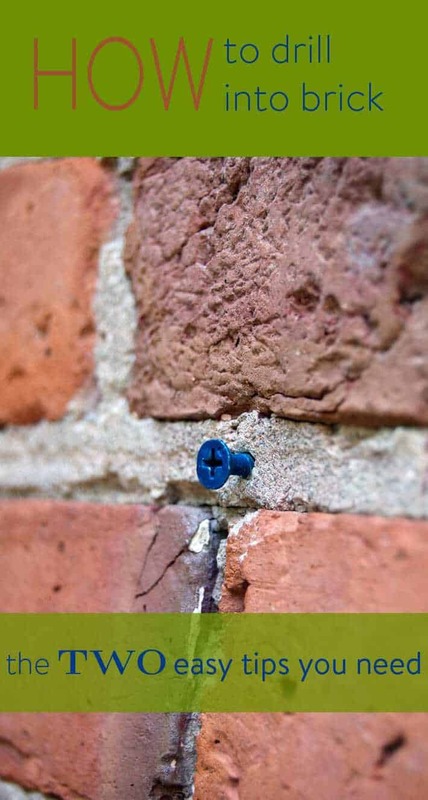 You can hang something on a brick wall in about 39 seconds as long as you have a masonry bit and a anchor screw (and a drill). Need a video tutorial? Here you go. 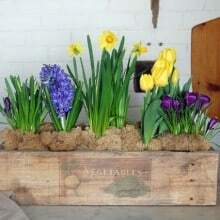 How to build a simple planter box. The perfect Easter centrepiece for $20. Agh! This is great! It’s so hard to get anything on brick, it’s always crumbled on me when I’ve tried any other way, or the screw just gets stripped. Thanks Karen! You “used a 3/16th screw with a” …. WHAT DID YOU USE IT WITH??? Don’t leave us hanging! LOL. Sorry ’bout that Sara … with a 5/32 drill bit. 🙂 ~ karen! But it all depends on what you’re hanging and the size of your anchor screw. Just make sure it’s 2 sizes down and do a test hole to make sure it works. ~ karen! I think I might have been distracted by the need for a vacation, lol. 2 sizes down from the 3/16th is the 5/32 drill bit. 🙂 ~ karen! Karen, just how many burritos CAN you eat in one sitting? Three large or 2 medium. But I feel sick. So really just one. But never just one. ~ karen! Yes. Well. I guess it’s hard to make an entire blog post about one, but never just one burrito in one sitting. But with the sick bit, you could stretch the post out a bit more. Actually, you being Karen and all, you would be able to make a blog post about the burrito thing no problem! LOL. I said that backwards. 3 medium or two large! The rest of my previous comment is completely accurate. 🙂 ~ karen! omg you crack me up! i was not expecting a chicken swing — can’t wait to see the swinging chicks!! I’m a fan of Robertson head (Canadian design) so may not be available in the States. I use the hex head tapcons, too. You put up a swing for your chickens? Awww, what a nice chicken mama! Thanks for the hanging post-will be fun to see how they do with it! Small words, short sentences, and the crucial info that no-one ever tells you – use a drill bit that is two sizes smaller than the screw! I swear Karen, you could teach me to do anything. So now I know why I always have such a hard time hanging stuff. I’ve been matching the drill bit size to the size of the screw. Although, now that I think about it, it makes perfect sense. Here’s a confession. I did have to read it twice before understanding that 5/32 is smaller than 3/16. The numbers are bigger, how can it be smaller? Gosh I hate math, or anything to do with numbers really. But if I had a whole set of drill bits in front of me and moved down two in size that would be obvious I guess. Still Karen, thanks for dumbing it down without condescending! When you do something you’ve never done before any little part of it can trip you up. Hi chickens! Thanks Susan! A lot of people have trouble hanging things on walls, brick or otherwise. With drywall you only need to go down one size, not two. And you should always do a discrete test spot because it really depends on the screw or anchor you’re using. ~ karen! Great info Karen and I love the swing for the chicks. You’re the best chick Mommy! Since you need a vacation and you can’t get there, treat yourself to a hammer drill. I drill into brick and mortar allot, it’s a nice girl tool to have. My hammer drill has two settings, one for hammer drilling and one for regular drilling. I knew what you meant about the 5/32 drill bit. Here in the states, your tapcon cement screws include the right drill bit right IN the box with ’em. We do that in Canada too, lol. It just depends on what you buy. 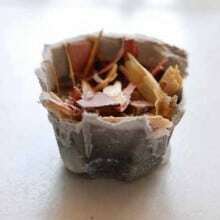 (a package with the drill bit or not). I have a hammer drill … or maybe it’s an impact driver, lol. I don’t know … I never use it. They are handy though. ~ karen! Thank you for this! 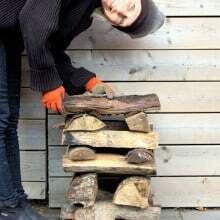 Was perusing Pinterest for shelving ideas to go on a concrete wall. Now I know I might actually be able to do it! My problem with drill holes into concrete/brick is the patching that needs to happen if something goes wrong/needs to be changed. I’m more that a little paranoid about causing cracks in my foundation (my husband says not to worry, but I can’t help myself). Our basement is under renovation and hubs is willing to drill willy nilly to put up shelves, but I can’t bring myself to do it. Any inspiring words of confidence? Or tips on how to fill concrete/brick holes? Can’t wait to see the chicken swing in action! I love that video, thank you for making it seems simple for us non math majors, the chicks are so cute, a swing? hummm – I want your screwdriver too, what is it called and where do I get one? Karen, can I assume these instructions apply to drilling concrete/cinder blocks as well? Thanks. Yup. Same same. 🙂 ~ karen! Hmm. My favourite right now is the Thug Kitchen’s roasted broccoli and chick pea burrito, but anything you put in a burrito is good as long as you have the right toppings and finish it properly. You need avocado, cilantro, salsa, and a bit of lime juice with a chicken burrito and finish it by pan frying it in about a tablespoon of oil after it’s all wrapped up. THAT’S the trick. 🙂 ~ karen! 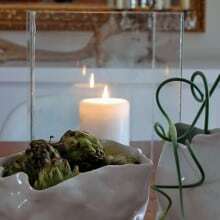 Karen – Something happened…… I didn’t get these last 2 blog posts – And I missed them something awful. I was beginning to think something had happened to you & you quit posting. I signed up again so maybe I’ll get tomorrow’s post – at least I hope so. I don’t want to miss any of them. They used to just pop up in my email & then I had to start opening them in my browser – never did figure out why. But I definitely want to keep getting them. I love what you do & how you write. This happened to me too!? I checked my junk mail – no posts hiding there. I’ll just chalk it up to gremlins – but at least you know that your subscribers are actively following your blog to such an extent that Jackie and I were concerned when we didn’t get our usual emails!! Just checked – not in junk email. Also – I did not get today’s post either. I don’t want to miss any of them. Hi Jackie! Do you happen to have a security spam blocker on your computer called Barracuda? It seems for some bizarre reason Barracuda has blacklisted my emails from people. I have no idea why and have contacted them and haven’t had a response as of yet. Lemme know! ~ karen! No – I have nothing like that – never even heard of it. I hope this is fixed soon because I don’t want to miss any of your posts. Thanks for helping. Hi Jackie! No idea what’s going on. I’ll look into it further. In the meantime do you have another email address I can subscribe you with to see if that works? ~ karen! No I only have the one email address. Finally. I know what to buy to hang the ‘welcome to the circus’ sign next to my front door. So…if mediums = 2 tacos each & larges = 3 tacos each…you must eat a hell of a lot of tacos…oh and thanks for this post cause I want to hang some cool stuff on the side of my concrete block shed…. Problem for me with drilling into brick is that old brick (which is what I have) can crack and crumble….after all it is just clay. 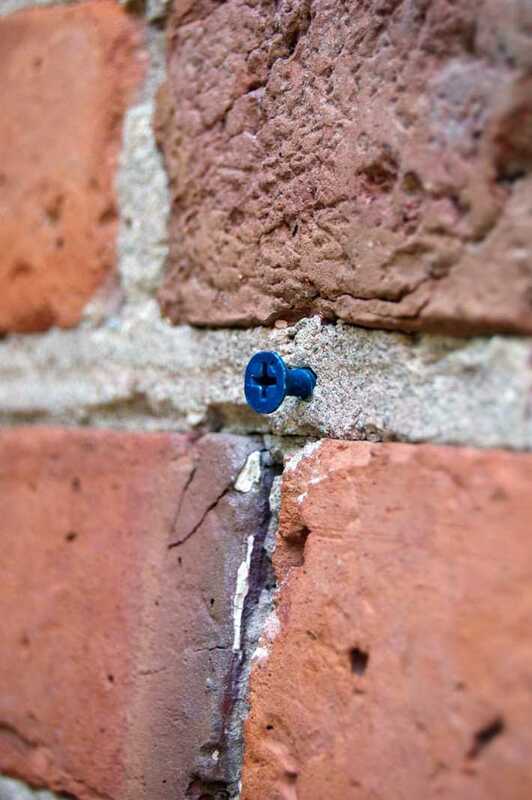 Problem with drilling into Mortar is that my brick wall has the brick sticking out farther than the mortar by a good 3/4″ so there is a gap that will be present when the item is drilled to the mortar and the screw will not be be able to be drilled all the way in. I find its better to go into the break unless the bricks are older and fragile then they can shatter but a good condition break is stronger and can hold more any day of the week!